Director – Jon Turteltaub, Screenplay – Dean Georgaris, Erich Hoeber & Joe Hoeber, Based on the Novel Meg by Steve Alten, Producers – Belle Avery, Lorenzo di Bonaventura & Colin Wilson, Photography (3D) – Tom Stern, Music – Harry Gregson-Williams, Visual Effects Supervisor – Adrian de Wet, Visual Effects – Double Negative (Supervisor – Raymond Chen), Image Engine, Instinctual, Scanline VFX (Supervisor – Moshen Mousavi), Soho VFX, Sony Pictures Imageworks (Supervisor – Sue Rowe) & Umedia (Supervisor – Bernhard Kimbacher), Special Effects Supervisor – Steve Ingram, Production Design – Grant Major. Production Company – di Bonaventura/Appelles Entertainment Inc./Maeday Productions Inc./Flagship Entertainment Group/On a Roll Productions, Inc.. The billionaire Morris travels just off the coast of Shanghai to visit the Mana One ocean laboratory that he has funded. He is witness as a team dive down in a submersible in search of a hidden area of warm current beneath the Marianas Trench. As they explore, the submersible is attacked and damaged by a 90-foot megalodon shark that emerges from the area beneath the Trench. The only person capable of rescuing a vessel so far down is diving specialist Jonas Taylor but he has retired since a rescue attempt went wrong five years ago and he was blamed by the official report. Several of the group go to find Jonas in Thailand but he refuses until they inform him that the submersible is captained by his ex-wife. Jonas agrees and conducts the dive. However, the rescue attempt ends up opening a funnel in the sediment layer from the trench and the megalodon emerges and attacks the submersible. Morris decides that he wants to capture The Meg but Jonas thinks this is crazy. At the same time, The Meg attacks the laboratory and makes its way to the surface, devouring all in its path. The killer shark film is big in the 2010s. That said, most killer shark films over the last decade have been down around the level of Sharknado (2013) and the likes of Sharktopus (2010), 2-Headed Shark Attack (2012), Avalanche Sharks (2013), 90210 Shark Attack (2014), Roboshark (2015), Zombie Shark (2015) and Sharkansas Women’s Prison Massacre (2016), among a good many others, which seem determined to mash sharks up with the most ridiculous thing imaginable. Since the 1990s, the theatrically released, big-budget killer shark film has been a rare item. Among these, efforts such as Deep Blue Sea (1999), Shark Night 3D (2011) and Bait (2012) have been more risible than scary. There were the moderate hits of Open Water (2003) and 47 Meters Down (2017) but they more fell into the survival horror genre than the full blown killer shark film. The only one that took itself seriously and held a modicum of effectiveness was The Shallows (2016). The Meg comes from Jon Turteltaub, who started out making light kiddie films, comedy and romantic fluff such as 3 Ninjas (1992), Cool Runnings (1993) and While You Were Sleeping (1995), before the hit Nicolas Cage vehicles National Treasure (2004) and National Treasure: Book of Secrets (2007). Turteltaub has previously ventured into genre material with Phenomenon (1996) in which John Travolta gained a supermind; Instinct (1999) with Anthony Hopkins as a killer anthropologist; the Disney film The Kid (2000) where Bruce Willis meets his boyhood self; and The Sorcerer’s Apprentice (2010), as well as producing the post-holocaust tv series Jericho (2006-8) and the horror series Harper’s Island (2009-10). When it premiered, The Meg was expectedly critically trashed. You are immediately reminded of Deep Blue Sea, a film that seemed to teeter between creating a series of suspenseful effects-driven set-pieces and the laughable. The film draws from other recent films such as Shark Hunter (2001), Megalodon (2002), Shark Attack 3: Megalodon (2002), Mega Shark vs Giant Octopus (2009) and sequels, Super Shark (2011) and Jurassic Shark (2012) in featuring a prehistoric megalodon, although does inflate the size of the shark, known to reach 60 feet, by half its size again. 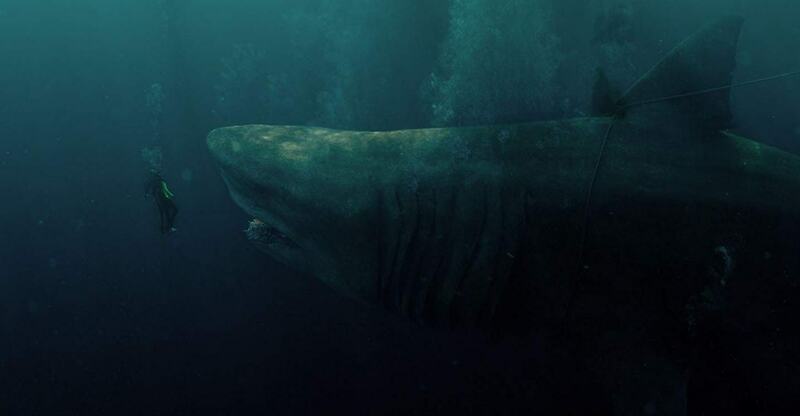 The Meg is the first of the modern theatrically-released killer shark films to be made as a CGI spectacular. Much of the film has been construed as a series of big effects-driven dramatic set-pieces. 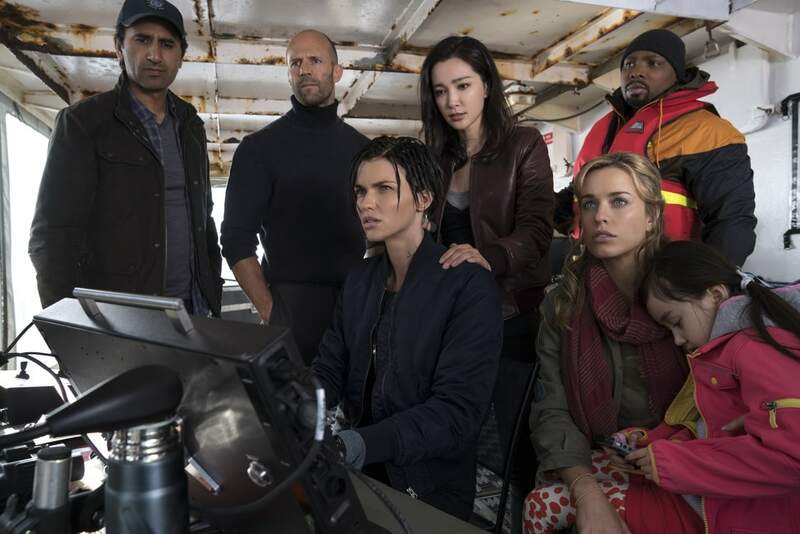 These get fairly entertaining – the scenes where Jason Statham conducts the submersible dive to make the initial rescue and the Meg emerges; the seat-edge scene as Statham swims back to the boat as the Meg heads towards him, he getting back on board seconds before its jaws snap shut inches away from him; a very tense sequence when Li Bingning descends in a plastic shark cage, the Meg starts trying to swallow it but it gets stuck in its gullet and Jason Statham has to conduct a free dive to rescue her as the shark comes after them and is only stopped inches away by its fin getting wrapped around an anchor chain; a scene where the Meg approaches a beach, its shadow passing underneath the bathers only for it to get the chains of several swimming platforms wrapped around it and drag these away amid mass panic. The climax of the film involves Jason Statham diving down and going into hand-to-hand combat with the shark. I had some reservations about The Meg based on Jon Turteltaub’s previous films, which have a tendency to favour action or easy emotional cues over good writing. However, he pulls all of these scenes off like a pro and keeps one on the edge of the seat. The effects work is exceptional and the dramatic intensity of the various set-pieces gripping. The result emerges like a Sharknado film with a sense of its own potential risibility but its tongue removed from its cheek and played straight. The Chinese box-office is an essential market to crack for any Hollywood film these days and many productions will go out of their way to cater to it – The Meg is Chinese co-produced and features stars Li Binbing and Winston Chao. One of the pluses of the film is that it truly embraces the diversity side of things and has an enormously varied international cast including Maori actor Cliff Curtis, Australian actor Robert Taylor, Icelandic actor Olafur Darri Olafsson and the Japanese-American Masi Oka. All of that said, the various characterisations only amount to something paper thin. From the first scene he appears, Rainn Wilson slots into the cliche caricature of the greedy businessman who endanger everything with his plans to capture the shark, along with the inevitable fate that he will get eaten written on his forehead. Jason Statham, himself a member of the British National Diving Team before becoming an actor, is a consummate professional, playing grim and serious (although he does get a cute kid for some moments of light relief) and a requisite scene where it seems he is required to take off his shirt and display a badass set of ripped abs. Among the rest of the cast, it is only Ruby Rees who stands out in any way with a sharp and jagged performance.